Yukon Gear & Axle offers all of the small differential carrier replacement parts that you need to reassemble your carrier. Oil slingers, thrust washers, shims, baffles, guides, spacers, pins, bearing screw adjusters, and more are available to complete your differential carrier project. 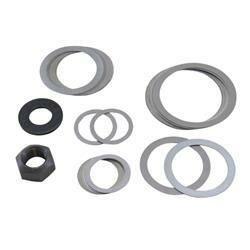 These components are offered for numerous axle models, such as various GM, Ford, AMC, Dana, and Chrysler applications.